Towards the end of the 1860s, Whistler began to reject Realism for Aestheticism. He was still painting modern landscapes, but now chose to veil the ugliness of industrial London by painting it at night. He prepared for these pictures by going out in a boat on the Thames after dark, committing the scenes to memory so that he could work on his paintings back in his studio. 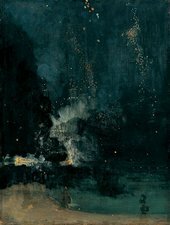 Whistler called these revolutionary works ‘Nocturnes’, deliberately comparing their lack of narrative content to music. Their compositions are startlingly simple, the colours reduced to a few delicate tonal harmonies. He produced them using paint so thin it was as translucent as watercolour. Most Victorian viewers were scandalised by their absence of subject matter and lack of finish. John Ruskin attacked them in print, prompting Whistler to sue him for libel and leading to a celebrated court case.